You’ve got a lot of options these days with countertops, for kitchen and bath. Kitchen countertops may be installed at the same time cabinets are installed, depending on the type of surface you choose. Bath countertops can be installed anytime after the cabinets and should be installed at least a few days in advance of plumbing final. In choosing the type of countertops, you’ll focus primarily on cost and appearance, but I believe you should give equal importance to durability and ease of cleaning. 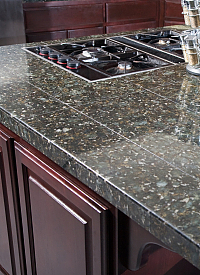 You have a bewildering array of choices in countertop surfaces, so let’s focus on a few of the most popular: laminate, granite, solid surface, and engineered stone. 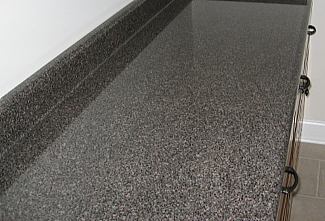 Laminates are composite, man-made plastic materials that have been around for decades as the standard of low-cost, easy maintenance countertops. Think of the brand names Formica and Wilsonart. Laminates have come a long way, style wise, and you can get some really nice looks at the lowest cost. One house of mine used a laminate designed to look like granite. It looked so much like it, in fact, that it fooled a house buyer, who actually asked what kind of granite it was. Laminate countertops will be fitted and installed by your cabinet maker.